The Cape Winelands of South Africa are beautiful. The wines from the region are also excellent. 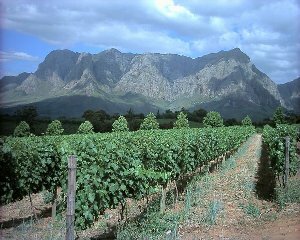 While in the winelands areas including Stellenbosch, Paarl, Constantia, Swartland, Durbanville and Franschhoek, a popular activity for both locals and residents is to go for a wine tasting or two at many of the top class wine producers. They are usually open to the public during the week, on Saturdays and some on Sundays. For a small fee, you can taste a few wines, whites, reds, ports, champagne – read Cape Classique, sorry, and decide whether or not you want to purchase a bottle or two from the estate itself. The grounds of the estate are often pristine, with mountain settings and great views. Some also have restaurants where you can enjoy a pleasant meal, a bottle of the estate’s finest and good company. My wife and I go wine tasting occassionally, I don’t taste though cause I am driving 😉 . It’s a lot of fun, a great way to see the beautiful Cape Winelands and savour a glass or two of South Africa’s finest.